I've already posted 1st baseman Lee May's all-rookie card, so let's skip ahead to 2nd base. Rod Carew checks in as the 2nd baseman on Topps' 1967 All-Rookie team (which makes sense, since he was the AL Rookie of the Year). 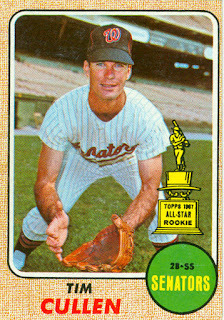 This was my first Carew card, as to this day Rod's 1967 rookie card is one of 4 cards I need to complete that set. 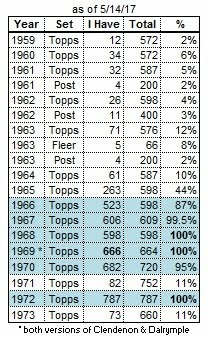 Rod assumed the starting 2nd base job on opening day 1967, and started 131 games there (missing 17 consecutive games in mid-August). 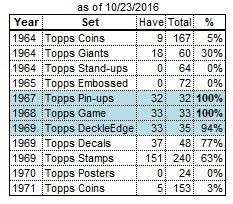 Carew was a slam-dunk for Rookie of the Year, getting 19 of the possible 20 votes (Red Sox' center fielder Reggie Smith received 1 vote). He also made his first of 18 consecutive all-star teams. 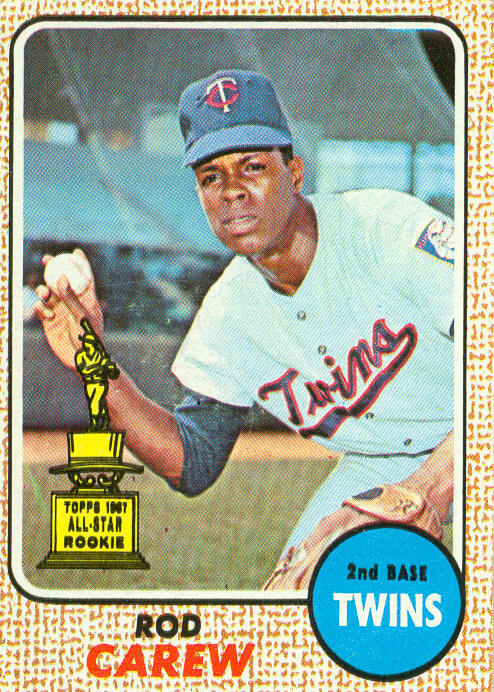 Carew played his first 12 seasons with the Twins. During that time, he led the AL in batting 7 times, and hit over .330 in 2 other seasons. 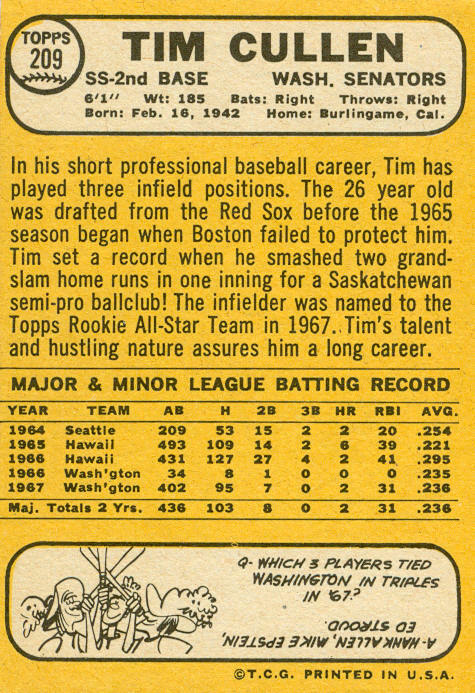 He switched to 1st base in 1976, and continued his torrid hitting. 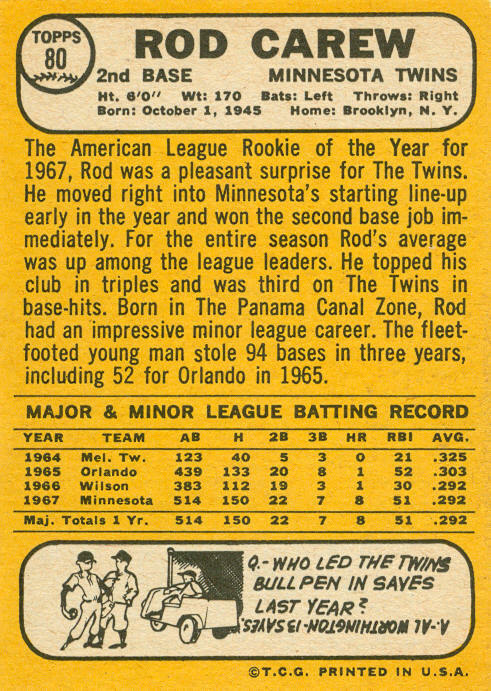 Rod was the AL MVP in 1977, while leading the league in runs, hits, triples, batting average, on-base percentage, and OPS. He also collected 100 walks that season. In February 1979, Carew was traded to the Angels for pitchers Paul Hartzell and Brad Havens, catcher Dave Engle, and outfielder Ken Landreaux. 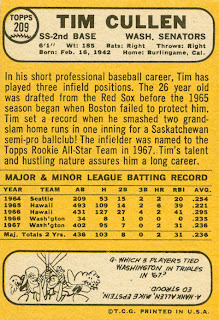 His league-leading days were over, although he hit over .300 in his first 5 seasons in California, including .339 in 1983. Injuries limited him to 93 games in 1984, although he hit .295 that season. Carew's final season was 1985, the only year he didn't make the all-star team. 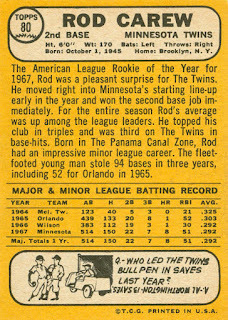 Rod appeared in the post-season 4 times: '69 and '70 with the Twins, and '79 and '82 with the Angels. He was inducted into the Hall of Fame in 1991, with 90% of the vote.